My feet look like boat oars in this picture! And let me tell ya, these stripes are pretty addictive to knit. All weekend I've been saying "just one more stripe!" instead of the usual knitter's plea, "just one more row!" I am so hooked on these that, to celebrate a really good bit of news that I got today, I have some of this yarn on its way to me so I can knit myself a pair (or two!) in red and white. There's nothing in the world like retail therapy. 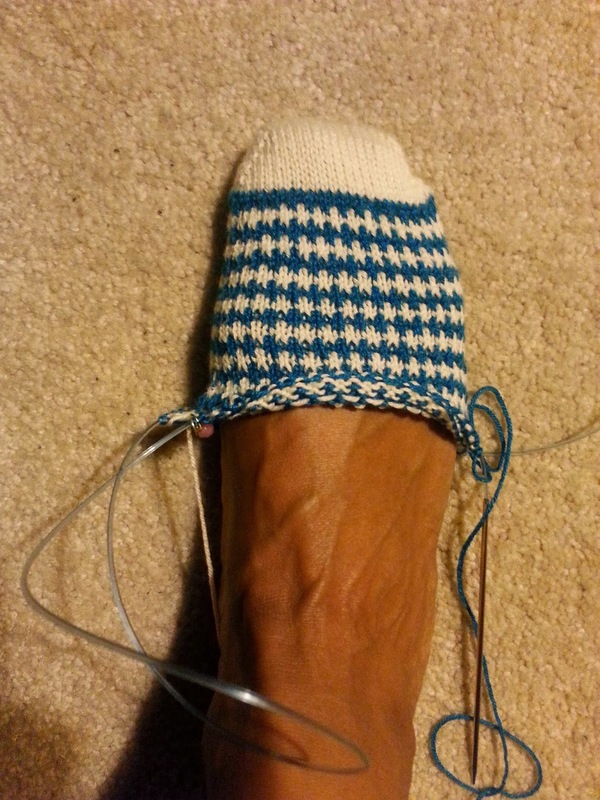 I will try again to knit the next pair two at a time. I've also decided which project from my WIP pile will get frogged next but I'll tell you later. Cliffhanger! Those stripes look wonderfully crisp, I can see why you are addicted! Do you have to carry a lot?